"This is the only one that is entirely contained within Bexar County," Garcia says. "It's also a solidly Democratic seat." Garcia says Trey Martinez Fischer is one viable candidate. He recently returned to the Texas House of Representatives after a two-year absence. But Fischer is possibly looking to increase his power there if Democrats take over that chamber in 2020, so his candidacy for the U.S. House wouldn't be a given. Justin Rodriguez, another viable candidate who replaced Castro in the Texas House, recently accepted a position on the Bexar County Commissioners Court. So Garcia says it's unlikely he would jump into a race for a seat in the U.S. House. Garcia says state Reps. Diego Bernal and Ina Minjarez could contend for Castro's seat. Both entered the Texas Legislature after winning special elections in 2015. Garcia says Minjarez has received support from Emily's List, the national political action committee that supports women candidates who advocate for abortion rights. "I think they both have some interest in it, but at the same time, I think they're both pretty happy with what they're doing," Garcia says. If Castro does run against Cornyn, he will not be able to run for his current congressional seat, too. A San Antonio congressman will ask the U.S. House to investigate why the federal government is calling into question the citizenship of Hispanics in Texas. 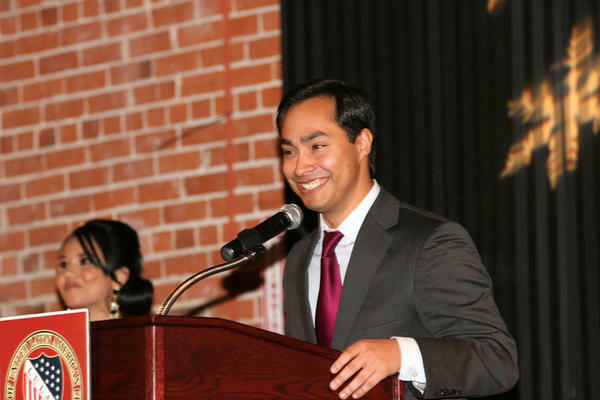 The Castro brothers — Joaquin and Julián — were sitting on stage at the Pearl Stable the evening of Oct. 30 for the San Antonio Public Library Foundation’s “Get Lit” series of author interviews.